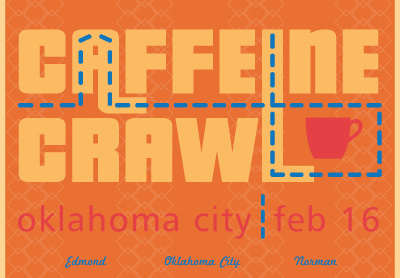 We probably could not have selected a better weekend in February for a Caffeine Crawl in Oklahoma City. We thought going into this event that the distance between shops might create a challenge, but all 100 ticket holders at this sold out Crawl brought their A game. Not just with patience, but overall enthusiasm throughout the entire Crawl. The LAB team was amazed and proud of the community that created this Crawl. The shops did a wonderful job on their topics and sharing their knowledge with all us. There were tasty pairings at Cuppies and Joe introducing our only cold brew with an orange zest brownie, and Syrup's chocolate chip pancake and coffee combo. Roasters Coffee Slingers and Elemental covered roasting with a hands-on approach and fielded questions on the process coffee goes through. t, an urban teahouse, added a break from coffee and covered tea 101 and 102 in one of the best short period presentations on tea we've seen - leaving the event with more tea fans. Cafe Evoke was a great host sharing espresso shots and giving us all a venue to share stories and meet new friends. Of course, having Mallory Roth from Askinosie Chocolate join in on the After Crawl fun, and a raffle of many great prizes, including Baratza's donation of their Vario-W grinder, made it the perfect finale. Proceeds from the raffle went to the Regional Food Bank of Oklahoma. We look forward to heading back to OKC for an even bigger Crawl in 2014. Below you will find every sponsor and shop that participated in the Crawl. Please take a few seconds to click on the links of some of your favorites. Here is a list of participating shops and their links. Be sure to visit these fine establishments whether passing through, or a regular.